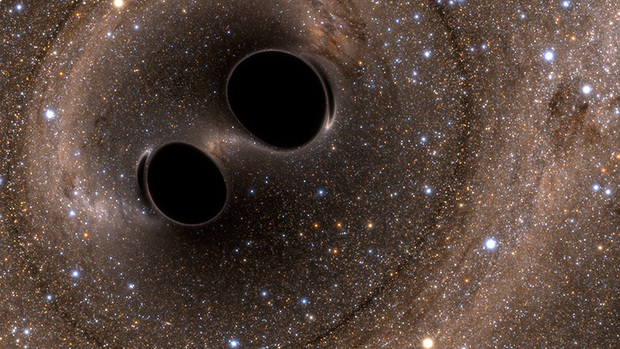 The two stars are orbiting each other and progressing (from left to right) to merger with resulting gravitational waves. 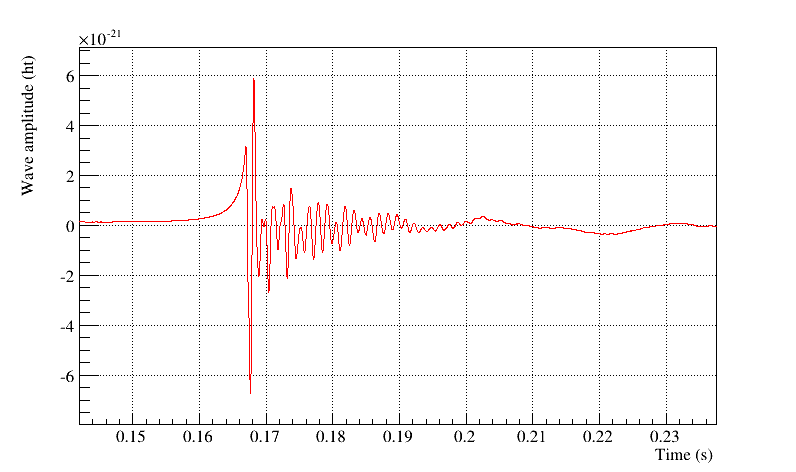 This gravitational wave would be seen during only 30 s in the Virgo data. 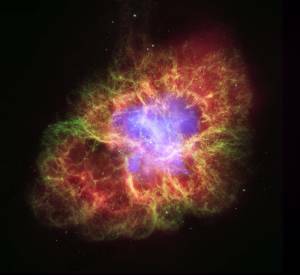 This composite image of the Crab Nebula uses data from three of NASA's Observatories. The Chandra X-ray image is shown in light blue, the Hubble Space Telescope optical images are in green and dark blue, and the Spitzer Space Telescope's infrared image is in red. The neutron star, which has the mass equivalent to the sun crammed into a rapidly spinning ball of neutrons 20 km across, is the bright white dot in the center of the image. Credit: NASA, ESA, CXC, JPL-Caltech, J. Hester and A. Loll (Arizona State Univ. ), R. Gehrz (Univ. Minn.), and STScI. Pulsar PSR B1509-58 observed by Chandra in X-rays. 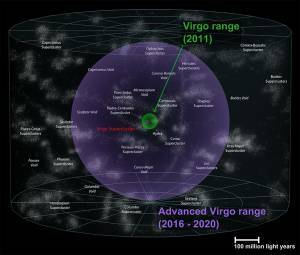 Advanced Virgo will search for gravitational waves coming from known pulsars (neutron stars from which we receive periodic light flashes). 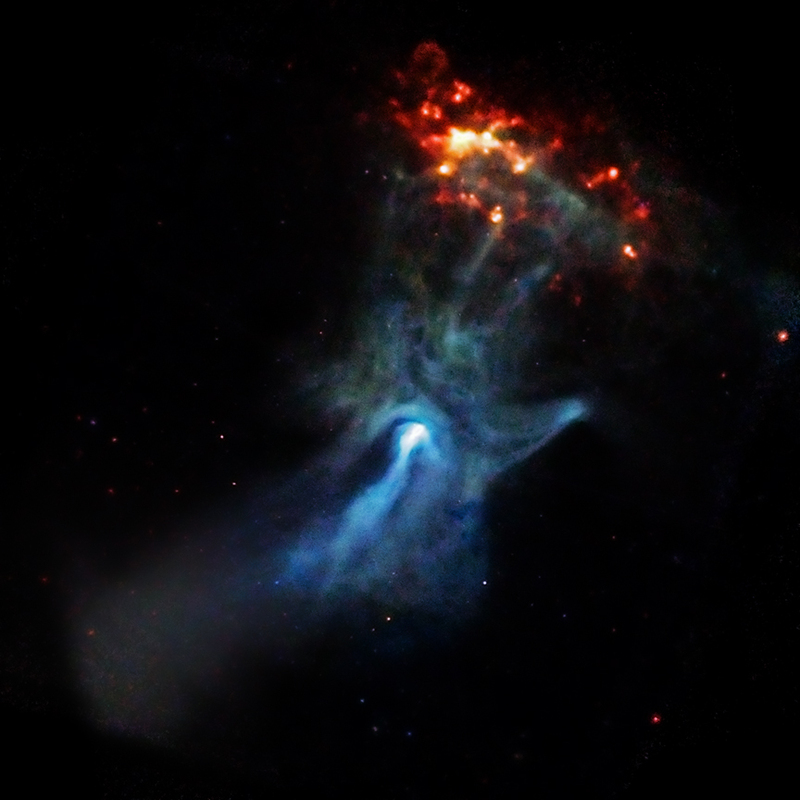 A pulsar is observed at the center of the image: it is a small, dense object only 20 km in diameter. It is responsible for this beautiful X-ray nebula that spans 150 light years. 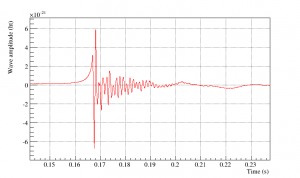 The signal is continuous over years, only a small window of 30 s is shown here. NASA's Chandra X-ray Observatory and ground-based optical telescopes have located the supernova SN 2006gy in 2006. The top panel of the image is an artist's impression of a supernova. The bottom left panel is an optical observation and the bottom right panel is an X-ray observation. 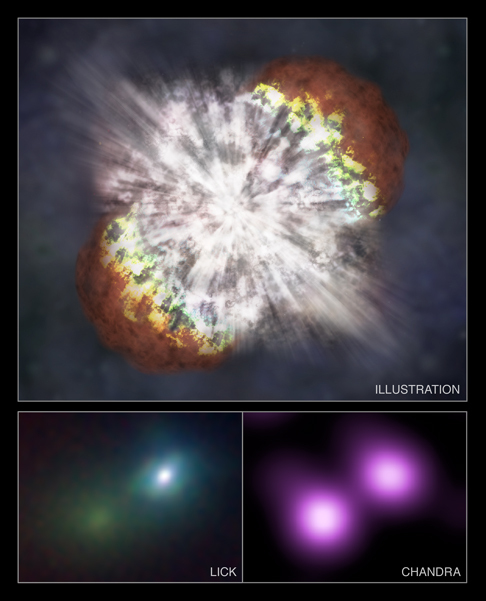 In these two panels, the supernova is the bright spot on top-right of the image. 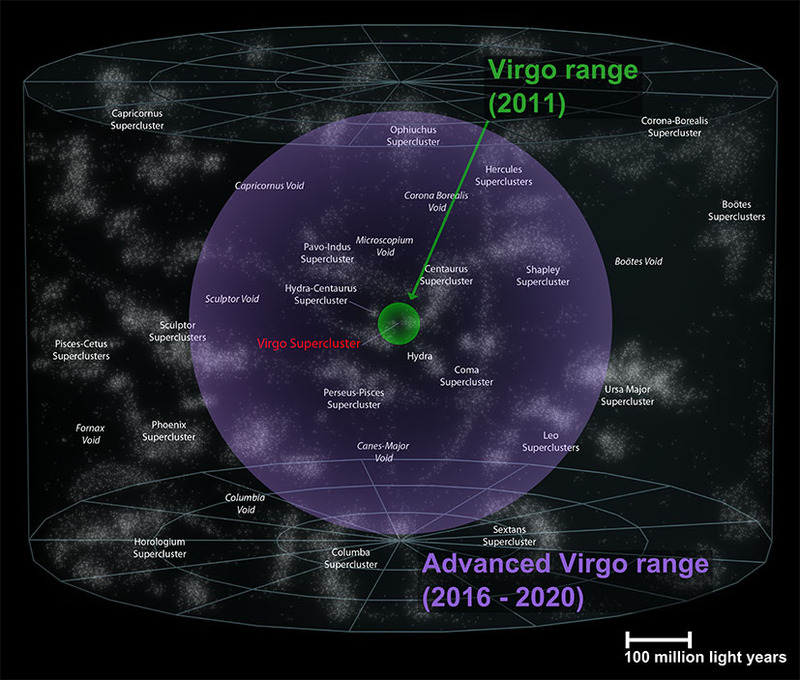 The nucleus of the galaxy where the supernova happened is the bottom spot. 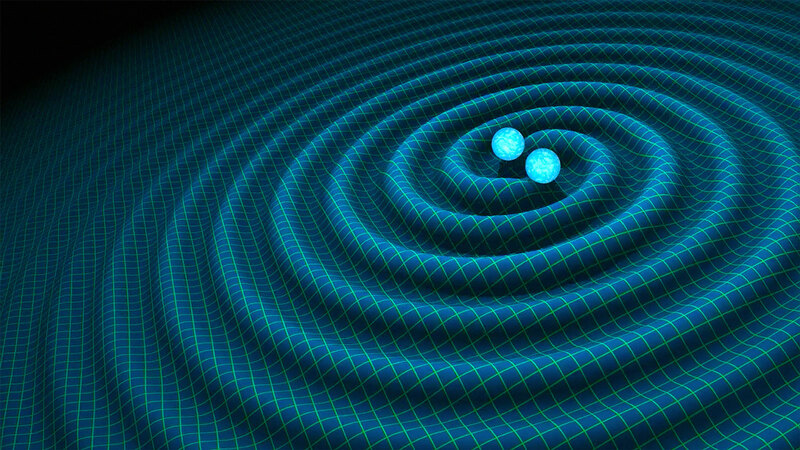 An artist's impression of gravitational waves generated by binary neutron stars. 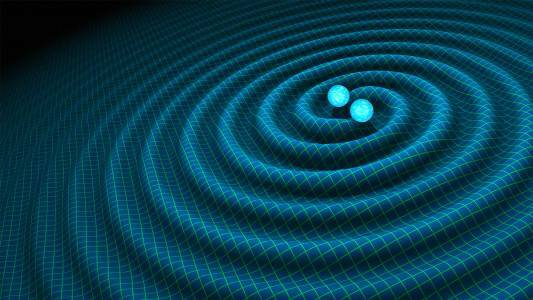 GW150914, the first ever detected gravitaional wave, came from two black holes that merged over a billion light years from Earth. This picture is extracted from a computer simulation showing what this would look like up close. The black holes are near us, in front of a sky filled with stars and gas and dust. The black regions are the shadows of the two black holes: no light would reach us from these areas. Light from each star or bit of gas or dust travels to our eyes along paths (light rays) that are greatly bent by the holes' gravity and by their warped spacetime.